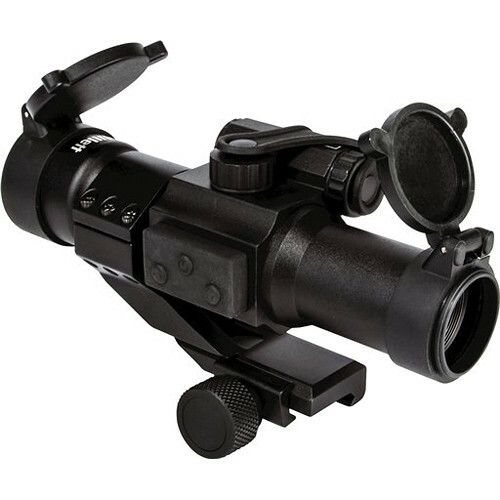 The M-Force 1x30 Red Dot Sight with 5 MOA Red Dot and Picatinny Riser from Millett's tactical series is a red dot sight for tactical firearms. It is best suited for use with flattop AR-15 Type rifles. The all-aluminum sight has ten brightness settings and is fully waterproof and shockproof. The reticle shifts in 1 MOA increments, and the scope comes with a 30 mm cantilever riser ring and flip-up lens covers. The riser mount positions the sight at a proper height on flattop AR-Type rifles. Comes in a Box packaging.